Traveling light was a blessing. We boarded an overnight bus that would take us over the border of Uruguay at around 2 am and we would arrive in Montevideo, the capital of Uruguay, at 8 am. Sleep came pretty easy, surprisingly, even though we had to wake up for the border crossing (a simple process). Bus travel in Argentina is pretty luxurious and cheap. You get a tray of food when you arrive. Just some sandwiches and cookies but it’s all pretty tasty. Then there are the seats. We slept through the bus ride on our cama seats. Cama seats mean that the seats recline back pretty far (almost flat) and they are very wide, oversized seats. They feel like they are made out of some thick memory foam, so comfy! With a smooth ride, the gentle rocking lulls you right to sleep. Greyhound needs to take some lessons!! We arrived in Montevideo awake and refreshed and we had no place to stay. The bus station seemed really nice and not scary like the one in Retiro. I noticed a different vibe almost immediately with our arrival to Uruguay. People seemed more relaxed and friendly. You could see it on their faces. I felt surprisingly safe, even though we carried a big backpack. There was a cute cafe and since we were hungry, we decided to get breakfast. The coffee was so good (a rarity, unfortunately, in Argentina). We got free wi-fi to boot and so we made a reservation at a hostel. Before coming to Uruguay, a lot of people told me that the people were friendlier, the vibe was more peaceful, the wine was just as good as Argentina, if not better and ditto for the beef. Well, it’s all true. People also told me Montevideo was barely worth visiting. I thought quite the opposite. We arrived to the hostel and were treated like family immediately. The city is pretty small, especially just coming from Buenos Aires. But I liked it better already. The city is surrounded by a huge walkway right on the ocean. The sea is brown here (because it flows in from a muddy river)and walking along it is a real treat, palm trees dot the walkway and sway in the breeze. People are hanging out everywhere enjoying the views and drinking maté with friends (they drink even more maté here than in BA!) We went for the sunset and were amazed at how many people were out enjoying it too. It seems like the whole city takes time to slow down and enjoy these moments. The main area of Montevideo is the Ciudad Viaja (old city) but we stayed a bit on the outskirts, very close to the walkway. It was about 8 km to get to the center of the old city if you walked on the path. But taking the bus was so easy. Uruguay is often referred to as the Switzerland of South America. Not for it’s cheese or chocolate but because they have a stable democracy and social benefits such as free education. They suffered an economic crisis in 2002 but has since rebounded. While Argentina is suffering right now with their devalued peso, Uruguayans are enjoying a pretty steady economy, comparatively (although everywhere in the world right now, people are suffering in some way economically). My last post about Uruguay that I wrote before I even came here was spot on and I wish we could stay here longer. Uruguay also has a big Italian influence in its food. We ate at a fantastic pizza place, that even rivaled NY pizza!! I can’t believe I type these words and for those that know me really well, you know that it’s completely blasphemous! But the pizza was that good. Thin slices of eggplant, oozing mozzarella cheese and a thin, crisp crust, sprinkled everywhere with a chiffonade of basil. It was heavenly. We ordered a tiramisu for dessert and the custard was to die for. Halfway through eating it, we noticed a thin brown spread in the middle and we cracked up laughing because yes, they snuck in some dulce de leche! The service was even good, a rarity in Buenos Aires. No one cares there if you like your food. Here in Uruguay, we noticed that many times they asked if you liked it. Not in the annoying, robotic way they do in the US but it’s as if they genuinely want to know what you think of it here. 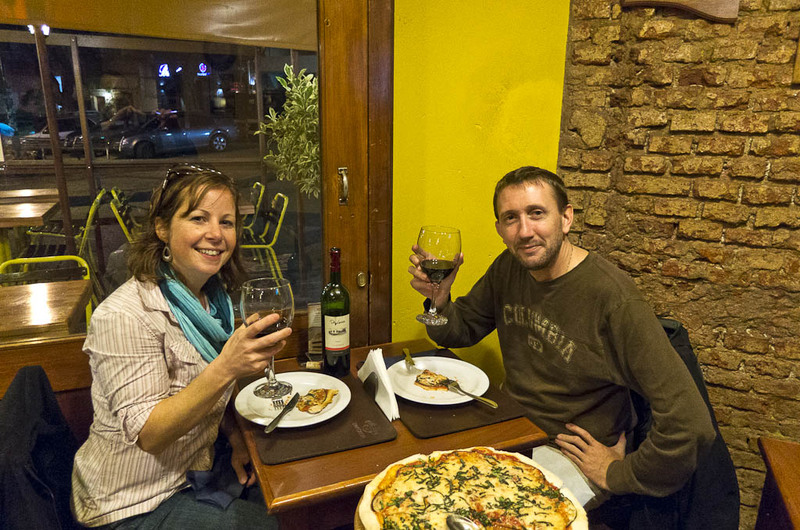 We enjoyed the pizza with our first taste of Uruguayan wine. They are known for a variety of Tannat, one that I had never even heard of. The tannat grape is grown widely in the Basque region of france, near the Pyrénées. In 1870 a Basque-French immigrant Pascual Harriague took these vines to his new home in Uruguay, where the grape adapted very well to the hot and humid conditions there and flourished. Now the wine is considered Uruguay’s signature varietal. It’s delicious. It’s often blended with Pinot Noir or Merlot to help soften the tannins. 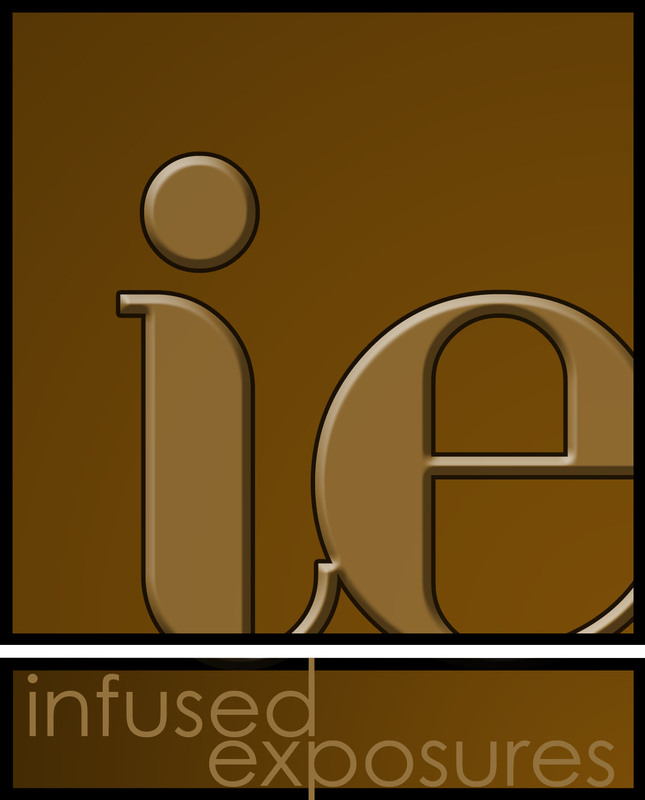 I was very pleased to discover this new and wonderful wine. The people we met in Montevideo were all warm and friendly. I think this is one of the main reasons I started to fall in love with Uruguay. They didn’t mind our bad Spanish. They didn’t look annoyed like they did in BA, as we made mistakes and spoke slowly. They patiently waited for us to finish. The hostel owners took time to explain the bus system to us, which was incredibly easy to figure out. We didn’t even need change because they have a guy who sits in the bus waiting to give you your change. 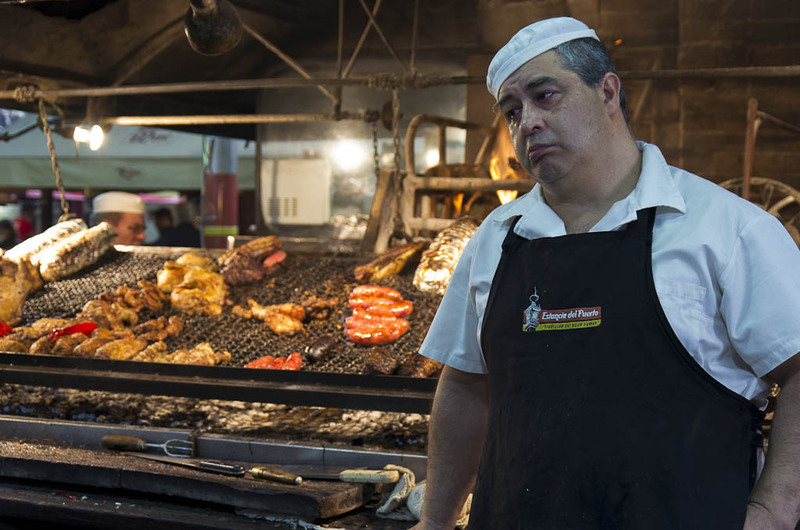 We asked where the best beef was in Montevideo and we were of course led to the Estancia del Puerto. It’s a bit touristy and when you walk in there are tons of asados to choose from. All of them beckoning you to come and try theirs. We chose one of the most popular and were somewhat disappointed but I think it’s because we didn’t choose the right meat. It was good just not exceptional. The guy who cooked our meat wore the funniest expression though, so it was worth the price of admission just for that! We continued to learn a little bit more Spanish, I tried to absorb what I had learned already but I was having trouble with people speaking to me. It was very difficult to understand them. I couldn’t tell where one word ended and another began. Most of all though, we just relaxed. 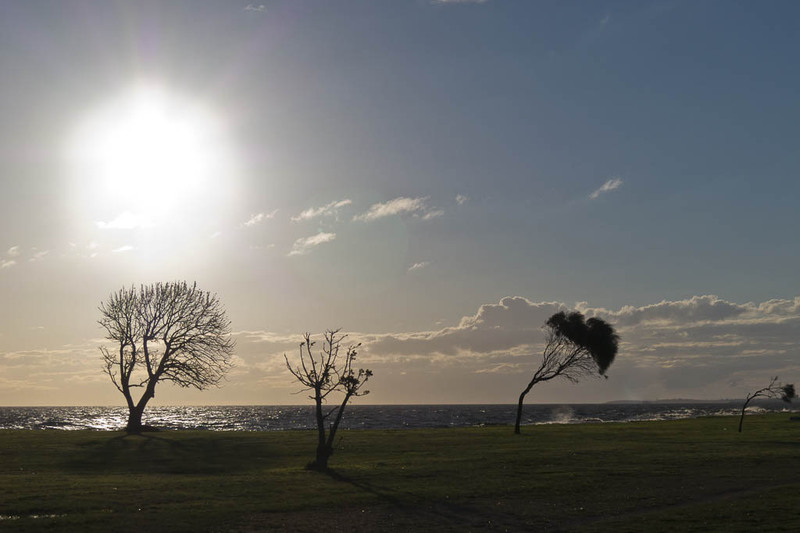 Montevideo felt like a breath of fresh air. I was already beginning to fall in love with the friendly people and the relaxed vibe of this small city. We stayed for two nights here and then after we planned to travel east along the coast of Uruguay. It was here where I would develop a full blown love affair for this country and soon I would even stop comparing them to Argentina (they hate that, by the way). I was to realise soon that they were two totally different places.